What happens when one wants to eliminate Christmas from being one of our dominant holidays and the ‘climate’ is not quite ready for such a move? One mixes Christmas in with other traditional holidays and then eliminates all of them. That is exactly what happened in one Minnesota elementary school. Based on the personal feelings of Principal Scott Masini, Bruce Vento Elementary School in St. Paul decided to quit celebrating Christmas, Thanksgiving, and Valentine’s Day. The reason…the need to find a way to honor and engage in holidays in ways that are inclusive of the school’s student population. [Paul Walsh,”St. Paul School Kisses Valentine’s Day, Other ‘Dominant Holidays’, Goodbye”, The Star Tribune, January 28, 2016]. Excuse me but aren’t all these students at least residents of the United States? The principal’s concern being that the celebration of these holidays needed to be discontinued until ‘we’ can come to a better understanding of how the dominant view will suppress someone else’s view. [Ibid]. Once again, having an ‘education background’ does not make one a good candidate for the school board. The school district released a statement that supported the school principal. They wrote,”St. Paul Schools is a diverse district that is filled with families from around the world and we strive to respect all cultures and all students. We recognize that not every student celebrates or participates in some or all holidays.” [Ibid]. Last time I checked St. Paul was in America and if those now living in St. Paul resent celebration of traditional American holidays they can always go back to where they came from. It’s time that they acclimate to the American way of life. Such incidents are the reason many US citizens want stricter immigration laws with requirements that immigrates leave their traditions and cultures behind or at least quit bothering with the traditions of this nation. Am I right or have I had too much eggnog? 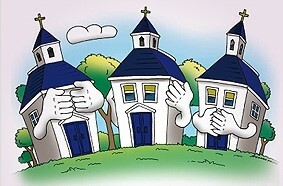 Where are the churches in permitting such a travesty? I had a situation when I was in the 8th grade in Brooklyn, New York. It was primarily a Jewish neighborhood and PS 234 had a goodly number of Jewish students…very nice folks, by the way. At Christmas time the school closed for the Christmas holiday…not winter holiday. Additionally, there were some Jewish holidays that were also celebrated…schools closed for those also. I, a Christian boy, loved it. I missed those days off when my dad finally got transferred to Maryland. We can celebrate a variety of holidays without having to cancel some so as to not ‘offend’…crying towels and coloring books make good Christmas gifts. Then we have a Massachusetts school that advertises itself as an “inclusive community”, however, it decided to ban Santa Claus from its annual Christmas concert in the hometown of Harvard University, all because someone complained. [Cambridge Public Schools, December 19, 2016, http://peabody.cpsd.us/]. Parents were so informed by principal Jennifer Ford of Andrew Peabody School in Cambridge. This included kindergartners and first through fourth grade students. Parent Robert Thompson told Fox & Friends that he comes from a city that celebrates diversity and tolerance and at its base this decision reeks of intolerance. [Robert Thompson, as seen on Fox & Friends, December 15, 2014]. The school was afraid that even the appearance of Old St. Nick would offend overly sensitive residents. Don’t get me wrong. I am not a big fan of Santa filling in for the spirit of Christmas but if it helps get kids into the spirit of the season. Then as they get older they can be introduced to the real meaning. Is this an effort to clandestinely remove Christmas without a blatant push to do so? How can a complaint by one person set the standards for a whole school? Why are the disagreeing parents not taking a stand? But then again this is the same town that in 2007 stopped a Boy Scout troop from collecting care packages for American soldiers. It appears as though the ‘fine citizen leadership’ saw that as making a political statement. [Amy Derjue,”Don’t Ever Change, Cambridge”, Metro Corp., November 14, 2007]. What else could one expect from a city that declared war on carbonation…soft drinks over 16 ounces. [Brock Parker,”Cambridge Mulling Soda Ban Similar to New York City Proposal”, Boston Globe Media Partners, LLC, June 18, 2012]. They also wanted to control how much pop corn citizens could pop and how many milk shakes they could drink. Further proof that the leadership of Cambridge is somewhere to the left of Vladimir Putin is contained in the 2006 edition of Harvard Crimson. An article in it written by a member of the Cambridge Public Schools Committee compared a law mandating the recitation of the Pledge of Allegiance to a “post-9/11 ultra-patriotism push.” [Laura A. Moore, “Pledge of Allegiance Controversy Grows in Cambridge Public Schools as Committee Member Criticizes Law”, The Harvard Crimson, Inc., February 23, 2006]. (And do you think voting for the school board isn’t important?) The committee member Luc Schuster told the newspaper that “pledging blind allegiance” to the United States stifles the intellectual capacity of children. [Ibid]. If that’s the case, he must have repeated the pledge hourly during his entire childhood. Do we want this kind of ignorance educating our children? Someone has been smoking too much mistletoe or had their spiced cider go hard. They do get it right sometimes in Tennessee when they might say about this situation…the cheese has done slid off the cracker. One more week to go in Christmas ‘lala land’ presented by the God-haters of America. When I was a kid I had no idea that Christmas was so offensive to some. My only complaint about Christmas was that it took so long to arrive. It seems, though, that Christmas decorations and carols bring ‘PTSD’ up on some our ‘snow flakes’. I suppose that ‘grandma getting hit by a reindeer’ is a little less challenging to their psychic make up. More ‘USA Believe It Or Not’ next week.